Orc Shaman, Dragonbane Gem, level 2, Boar - Big Waaagh! Orc Shaman, level 2, Dispel Scroll - Big Waaagh! This time I had 2 level 2 orc shamen to deal with. That means they are going to have as many spells as level 4, but the risk of losing one does not cripple magical abilities of the army. +2 to dispel is always handy. However, I decided their main impact will be offensive. Big Waagh! has some nasty spells in its list with the dreaded Foot of Gork in particular. One unit of Night Goblins was gone and Big Uns stepped in. That is another change that improved offensive abilities of the army. S5 attacks in the first round, with quite a number of these due to extra weapon mean trouble for my small units. Whatever attacks them is going to be bloodied for sure. In order to take them out I need proper combined charges, with the aid of buffs and hexes for good measure. I was happy to see only one doom diver but rock lobba can hurt my small units too. So I am not sure if that is going to be that much better. 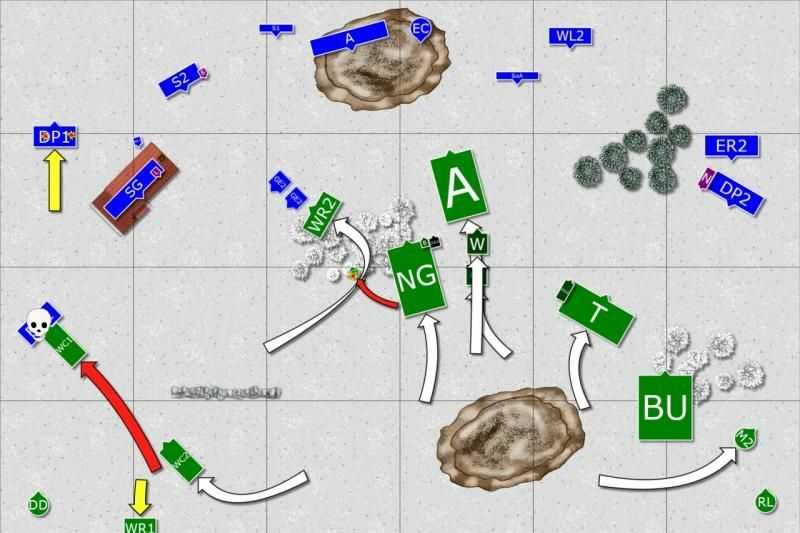 Obviously rock lobba will target infantry more often but it still has a good damaging potential. 1. Can wardancer devise a plan to beat me this time? 2. Can I come up with a counter and adapt quicker to the new situation? I must admit I came up with a few options and had to quickly decide what to choose. 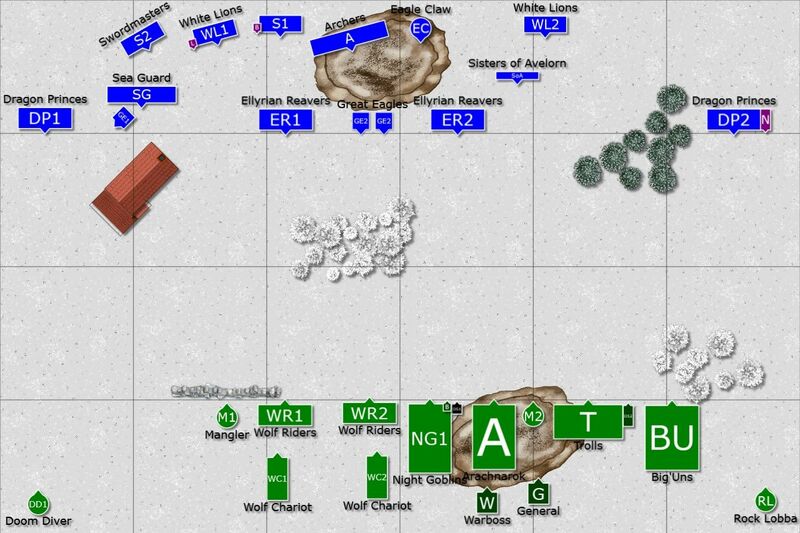 I considered deploying with refused flank and rolling the left flank. 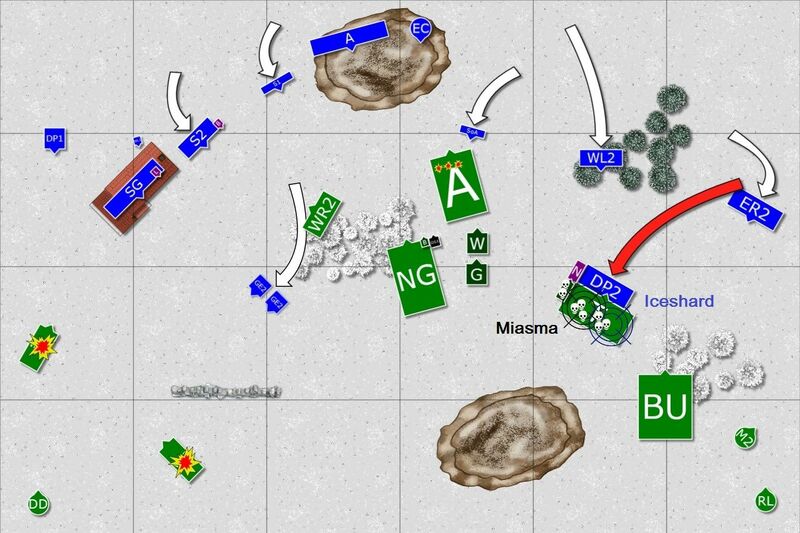 The advantage was that I could move fast units quickly and overwhelm light troops of the enemy there. But that would have left the hill completely vulnerable. 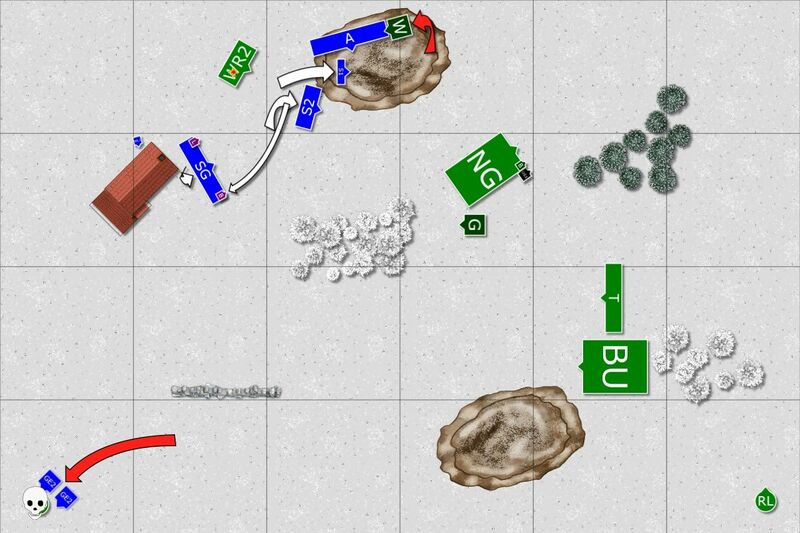 On the other hand I wanted some units on the right flank simply to threaten the advance of the green horde and be able to perform classic double pincer maneuver. I also know that taking fight to the enemy can be the best defense and I could not allow the war machines to be unoccupied, even if there were only 2 of them. That is why I chose the latter option. Orc Shaman on Boar got: Fists of Gork, Ere We Go! This time Orcs and Goblins won the roll off and had the first turn! Orcs and Goblins advance through the center with the Arachanrok leading the way. On the left flank wolven tribes guarded the lonely doom diver. 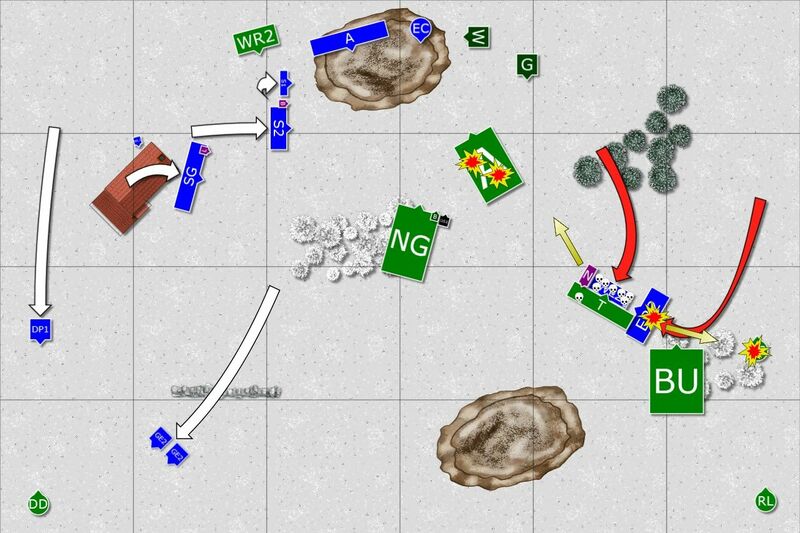 While on the right flank trolls went stupid despite desperate attempts of goblin bsb to wave his tattered banner to get their attention. Big Uns didn't enter the forest much not wanting to disrupt their formation and be hunted down by vengeful dragon princes. While one shaman was busy talking sense to dump trolls another one enjoyed the might of winds of magic. His prayers were heard and huge green foot stomped elven warriors into oblivion. First White Lions and then Swordmasters suffered horrendous casualties. However, due to irresistible force with which the spell was cast it also went wrong and the foot appeared on top of warboss riding wyvern but fails to wound them. The resulting explosion, however, wounds shaman, warboss and his pet wyvern. After such an impressive spell casting the crews of the war machines stood in awe and their own shooting was miserable in comparison. One of the great eagles sacrificed itself and landed on top of the Mangler Squig destroying it by also being killed in the process. Pair of eagles feigned the fly over the forest that resulted in the release of the fanatics. One of the lunatics hit the forest and killed itself, the other was still spinning around. Larry the Loremaster tried to Spirit Leach the chariot but this attempt was scrolled. Burning gaze was dispelled and final attempt to cast a fire ball simply failed. Sea Guard aimed at wolf riders, got two of them and the rest of the pack fled but the chariot felt brave and didn't panic at all. Archers aimed at another wolves but killed only one. Only a single wound was also inflicted on the chariot by the eagle claw. Due to the fact that trolls were still out of range Sisters aimed at the general but could not penetrate the thick hide of the Wyvern. Not quite a good start for the Elves. Spotting the opportunity, the chariot charged reavers who had to hold but died to an Elf. The main body of the army kept up the pace and Arachnarok spearheaded the advance. While magic was stopped the shooters did better. Doom Diver hit Dragon Princes and the impact and death of two knights spooked the horses and remaining two had to retreat. Goblins on the back of the Arachanrok shot at the nearby Sisters but surprisingly their light armor saved some of them! The situation didn't look good for Elves, with advance on the left flank pushed back, staggered formation and delayed right flank too. Dragon Princes led by the Noble charge Trolls. The rest of the army tries to rearrange the formation despite heavy losses. Larry the Loremaster aids attacking knights and powerful hexes are cast on Trolls. The elven heavy cavalry kills two monsters while the noble cuts down the shaman. Trolls puke back at them and corrosive acids kill three dragon princes and steadfast trolls don't move anywhere. Larry the Loremaster then focuses on chariots. One is spirit leached and the other is engulfed in flames but somehow survives! (Edit: I got 9 hits but only 2 wounds!). The shooters need to finish the job for him. Archers, Sisters and Eagle Claw all target Arachnarok and wound it 3 times! 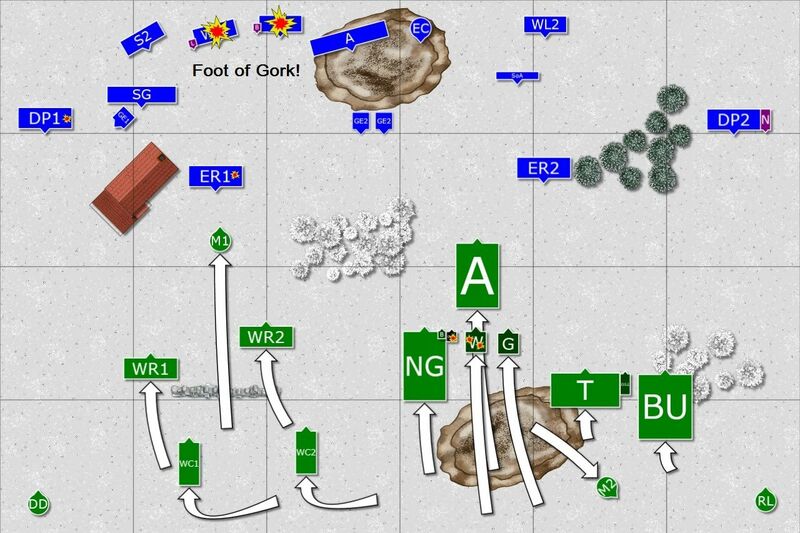 Orcs and Goblins push through the center! Arachnarok charges few sisters before the goblins behind them do it (Edit: failed animosity test). Wyvern twins fly close to the hill and it is obvious they are going to attack soon. Noble and Dragon Princes managed to kill one more troll but dragon princes died yet again due to corrosive vomit! Trolls barely lost but held their ground anyway. Disaster on the right flank! The units on the hill know it is their last chance to make an impact before the wyverns swoop down and all aim at arachnarok. Larry the Loremaster casts searing doom and fireball at the enormous spider and inflicts 2 more wounds all by himself. 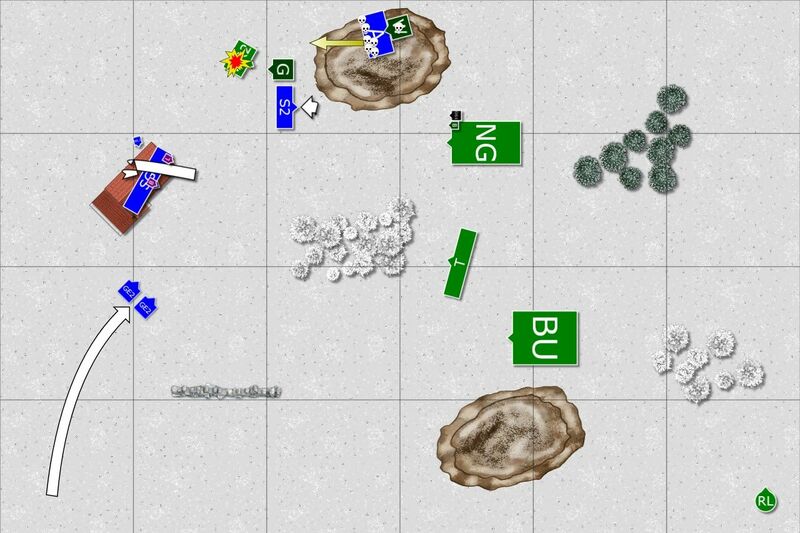 Then Sea Guard, Archers and Eagle Claw manage to shoot enough arrows to kill the beast at last! But that success was not cheered upon for long. White Lions and Reavers aided lone hero in the combat against Trolls. Despite many high strength attacks regenerative powers of the trolls are amazing and only a singe wound is inflicted. Trolls hit back hard and no more than 3 lions survive that counter attack. Noble and Reavers are forced to flee, Lions stubbornly holding the ground to buy them time. What is more, Reavers happen to flee through the forest and straight into Mangler and all of them die horrible death. The only consolation is that the crazy squig is no more. Instead of break through on the right flank the Elves suffered horrendous casualties and the situation became very serious. Fleeing Noble is attacked by the Goblins (Edit: failed animosity again and again 6 on the roll!) and combination of poor flee roll and very good charge roll see the noble trampled and stabbed to death. Warboss on Wyvern finishes Eagle Claw quickly and overruns into the flank of the nearby archers. Doom Diver hits Dragon Princes again and two caledorian knights were destroyed before they managed to reach the enemy. Rock Lobba hit the Swordmasters and they lost 3 of their numbers. The situation is grim but Elves don't give up. Larry the Loremaster, however, disappoints when he fails to cast his first spell and loses concentration (Edit: I got 1,1,2 on the spirit leach and then got 2 for reroll .). 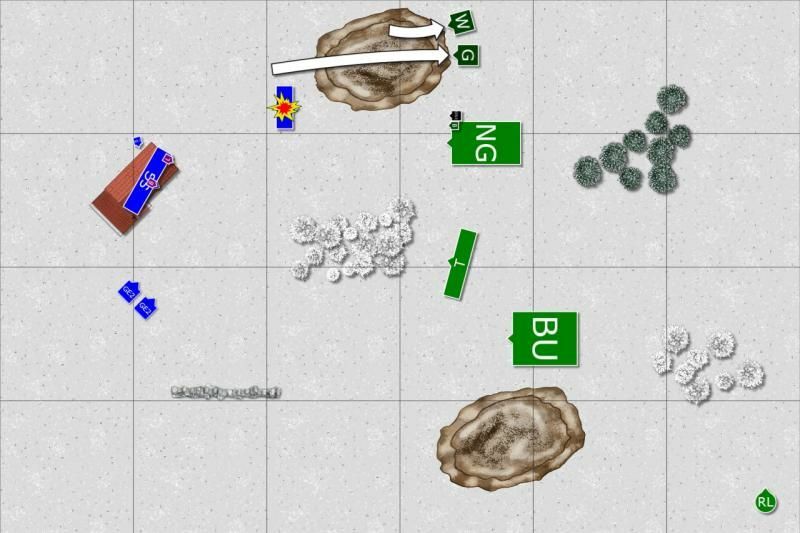 Champion of the Archers unit steps up and dies in single combat just to buy some time for the few reinforcements to arrive. Charge of the Orc Warboss! Orc General finally managed to charge himself too and 3 Swordmasters died while the Wyvern carried its master to the safety. Archers put up a great fight, wound a warboss (now on single wound only) and even win combat but warboss holds. This time Archers can't find the weak spot in warboss armor, lose badly and flee to be caught in pursuit. With no real threat to fight orc Warbosses lose interest and fly away. The rest of the army also does not move forward anymore. The last word will belong to the Elves. Could they dish out some damage to make the defeat smaller? Larry the Loremaster was under great pressure. He had limited amount of time to choose some spells and try to make the difference. He chose spirit leach in order to kill the wyvern and hopefully scare the warboss but despite irresistible force and dead wyvern the warboss didn't care. (Edit: I am not sure if that is really the case, is the rider required to pass panic check if the mount is slain?). Then in the last attempt he casts a medium fireball on trolls but manages mere 3 hits and with that last act he fails to turn the tide in the end. Orcs and Goblins carry the day and have their revenge! Congratulations to wardancer for great game and well deserved victory! I think he played much better than last time and despite very good magic, it was about his other decisions that made the difference. For example, he didn't provide easy targets for shooting, kept chariots in reserve and held the left flank long enough to inflict some damage. He lost 2 chariots, wolves and doom diver for the price of reavers and dragon princes. 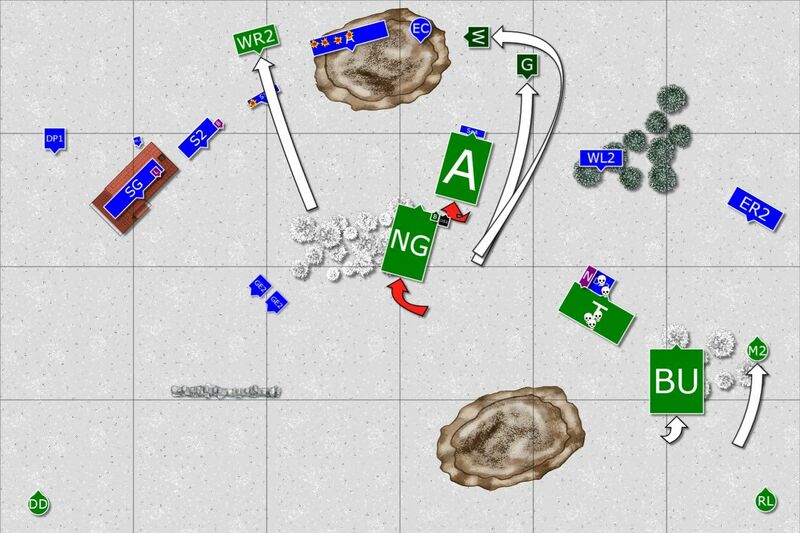 A very good exchange especially that it took me 4 turns to clear that flank and even then it was too late anyway. He used mangler on the right very well too. He simply prevented light cavalry to go that direction and it was only a coincidence that fleeing unit destroyed it. His more aggressive push through the center proved to be successful too and his wyverns saw combat, decimated the enemies and survived the battle. Arachnarok was lost but it provided a cover and was an arrow and spells magnet that allowed wyverns to survive. I tried to analyze the game and see where did I make the most crucial mistakes. It is worthy noting that despite the fact that foot of gork stomped my three units it didn't destroy any of them entirely and under the rules of the tournament wardancer is going to attend they gave up 50% points. Of course the fact that they were useless after that was very important too. I believe that the biggest mistake was with the charge of Dragon Princes and Noble against the trolls. They were fresh and I had no hope to break them on steadfast. 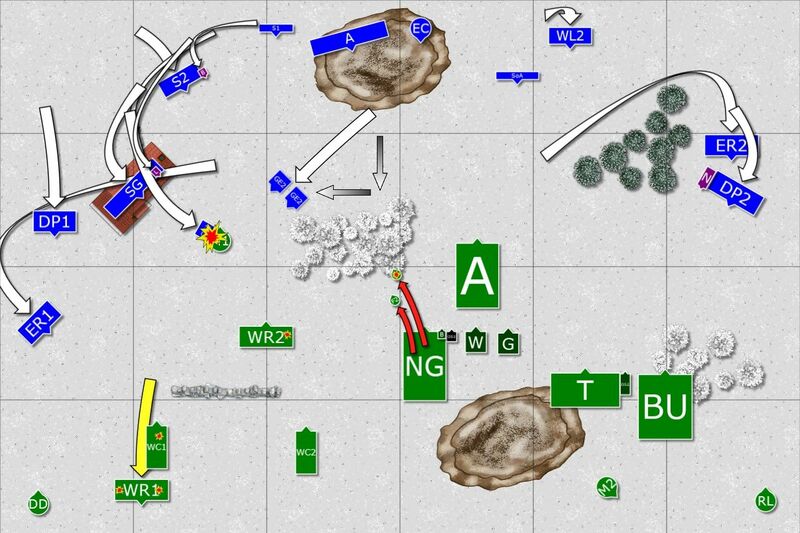 I was too far with reavers and Lions to combine the charge and when I attacked again it was not the best option either. In the end I lost 3 units and a hero for no gain. That simply cost me the game. 1. Protected back yard against wyverns - no option for them to charge from the flank or have safe landing zones. 2. More time to weaken the trolls and be able to combine the charge of Dragon Princes, Noble and White Lions together. As a result of that reckless and unsupported charge I not only lost 3 units and a character as immediate consequences but I also lost eagle claw, archers and Swordmasters as I could not protect them or counter charge the attacking characters either. My last turn spells priority was poor too. What I should have done instead was to cast fireball and burning gaze at trolls, add whatever shooting I had left and maybe that would have been enough to destroy them. I also should have cast spirit leach on wounded shaman simply to get points. In the end I lost by 600+ points and destroying trolls and/or shaman would have make the defeat smaller.